When you think of Seville, what things do you think of as being the most typical or emblematic of the city? The Giralda Tower and Cathedral? Bullfighting? Flamenco? Blue skies and orange trees? Well, all those and more, probably, but there is something else that you will see almost everywhere here, from the most humble places to the grandest, and which add another dimension to the visual richness of the city. I’m talking about azulejos, the painted and glazed tiles that seem to decorate almost every surface, from the undersides of the balconies (always look up!) to the grand expanse of the Plaza España. The centre of the ceramics industry has always been in the neighbourhood of Triana, in the area behind the market. Pottery has been made there using local clay from the river at least since Roman times, and Seville’s patron saints, Justina and Rufina were potters, their status perhaps reflecting the importance of the industry. But it was in Moorish times that the arts of painting and glazing the tiles really got going. Prohibited from depicting living things, it was they who created the abstract geometric designs that are still common today. Tiles are also prominent in church shrines, and in signs and advertising in markets and shops, but although you can find tile work everywhere, from apartment lobbies to bars and around doors and windows, some of the finest examples in public spaces and monuments. The walls of the Alcázar are profusely decorated with tiles from the early Christian era that were still made using the techniques developed by the Moors. 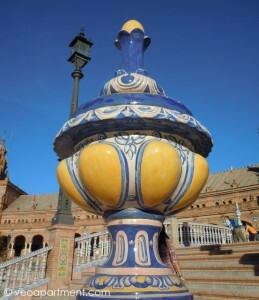 Even more spectacular are the tiles of the Plaza España, which showcase the designs and techniques of the early 20th century ceramics industry, particularly in the alcoves that depict historic moments from each of Spain’s provinces. 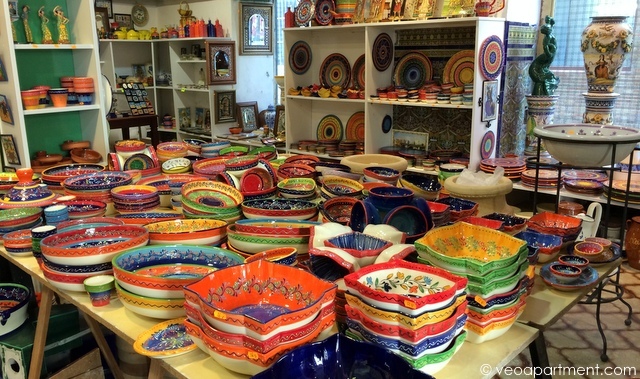 Although you can still find little ceramics shops in Triana, and a few artisans working using the traditional methods – though the old wood-fired brick kilns have been replaced by electric kilns – the industry has declined, and ceramics are no longer produced here on a large commercial scale. Nevertheless, this part of Triana, where the entrance to the old Ceramica Santa Ana is an important landmark, is still worth a visit. The market gives a good idea of how tiles were used for signs, and in the remaining small workshops you can find some pretty pieces that are great for souvenirs. In commemoration of this history, a new museum, the Centro Ceramico, is soon to be opened next door to the Santa Ana, where you will be able to see some of the old kilns, and collections of both traditional and modern tiles.